(Bloomberg) -- An Arkansas policy backed by the Trump administration that requires people to have a job or lose Medicaid coverage will drop 4,353 people from the health program. The Trump administration in January allowed states to propose so-called work requirements in Medicaid, the state-federal health-care program that covers more than 73 million low-income Americans. It’s the first time the federal government has allowed a work requirement in the program since it was created in 1965, and part of a broader effort by the administration to put new conditions on people who use government assistance programs. Asa Hutchinson, Arkansas’s Republican governor, said that many people had met the requirements, and the state is only dropping those that didn’t. People subject to the rules have to report 80 hours a month of work or other activity such as job training, education, or volunteering. If they’re out of compliance for three months out of the year, their coverage is revoked for the rest of the year. The change will save the state about $30 million, Hutchinson estimated. The policy puts Arkansas at the center of a fierce legal and political fight over Medicaid, which has long been a fall-back health-care option for the poor. Under the Affordable Care Act, Medicaid was expanded to cover uninsured Americans through a mix of public and private insurance. The terminations come as the Census bureau on Wednesday reported that annual gains in health insurance coverage stalled in the first year of the Trump administration. The uninsured rate in the U.S. remained at 8.8 percent in 2017, even as employers, the main source of coverage for Americans, added more than 2 million jobs last year. Health and Human Services Secretary Alex Azar, whose agency approved the work requirements and is defending them in court, said his goal is to expand insurance coverage overall. A coalition of legal groups has challenged the Arkansas work requirements in federal court in Washington, D.C. An earlier lawsuit in the same court temporarily blocked work requirements in Kentucky’s Medicaid program that were set to take effect this summer. States need permission from Washington to impose work requirements. In addition to Arkansas, Indiana, New Hampshire and Kentucky have won approval for them. At least nine other states are considering adding the rules. Proposed work requirements in 10 states could affect 1.7 million beneficiaries, PricewaterhouseCoopers Health Research Institute estimated in April. The Affordable Care Act allowed states to expand coverage to childless adults above the poverty line, including people with incomes of up to about $16,000 a year for an individual or $34,000 a year for a family of four in 2018. In Arkansas, one of 33 states and the District of Columbia that expanded the program, Medicaid covers about 30 percent of the population. Like other states enforcing work requirements, Arkansas is aiming the rules at the group that got coverage under the Affordable Care Act, while the elderly, disabled and children are exempt. Work requirements already exist in federal food and cash welfare programs, and the Trump administration intends to expand them. An April 10 executive order called to reform welfare systems by “introducing new work requirements when legally permissible,” to encourage self-sufficiency. The Trump administration and state officials who favor the policy argue that it will draw idle people into the labor force, give them a path off of Medicaid and onto job-provided insurance, and improve people’s health through the social benefits of work. Critics call that rationale a smokescreen for shrinking a safety-net program that Republicans have long opposed. “What’s happening in Arkansas is confirming my worst fear, which is that this is really just designed to kick people off of coverage,” Alker said. Practical barriers to meeting the new state rules endanger some Arkansans’ coverage, said Kevin De Liban, an attorney with Legal Aid of Arkansas who is involved in the challenge to the work requirement. People must report work hours online in a state with one of the worst rates of internet connectivity in the country. 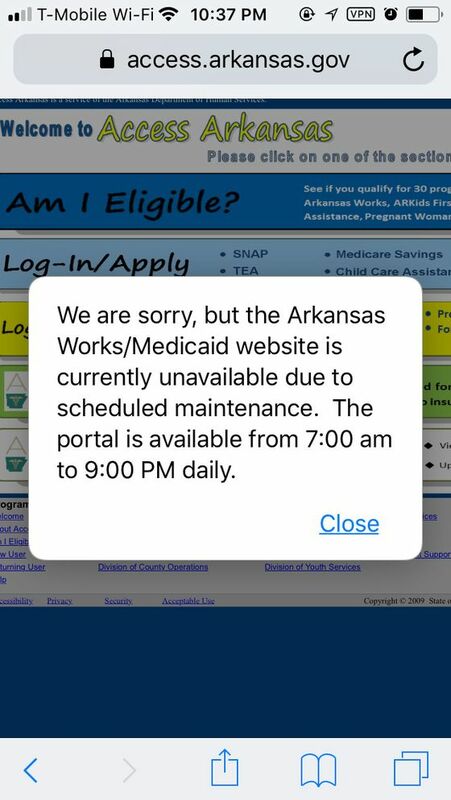 The reporting system is also offline every night for 10 hours while it “runs batches, system updates, etc.,” Amy Webb, a spokeswoman for the Arkansas Department of Human Services, said in an email.